With five millennia of history, and a plethora of religious and civil ceremonies, marriage is a popular means of producing families. Yet matrimony isn't the only method of uniting people, nor even is it the most effective technique. Modern science suggests a far more profound alternative, one that does not operate by religious tradition or civil mandate, but rather bonds couples by a law of nature: quantum entanglement. More here. For an exceptional back-in-time experience -- to hear Ezra Pound reading his own work --- visit the University of Pennsylvania's PennSound Ezra Pound Page. 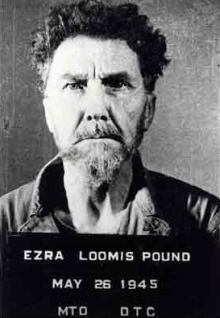 Grander than the Beatles and performing without a back-up track --- EZRA POUND LIVE! 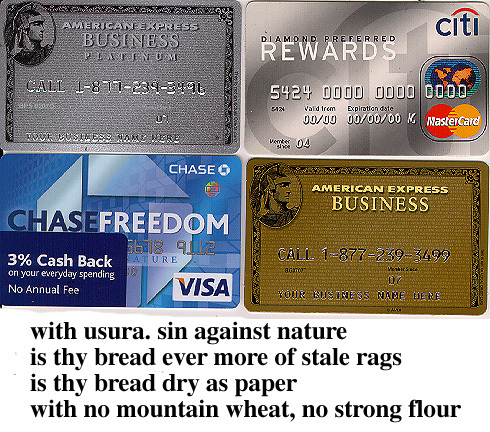 --- the poet himself chants With Usura in this mp3 recording. 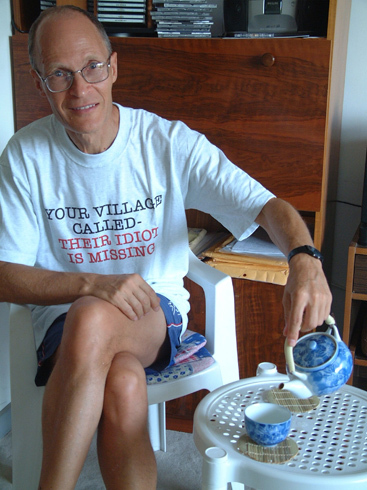 An extraordinary man raising his solitary voice against the enslavement of men and women by economic institutions, Pound's old-fashioned words ring as soundly today as a quark explosion in the Large Hadron Collider. that delight might cover their face. and halo projects from incision. but it is made to sell and sell quickly. with no mountain wheat, no strong flour. weaver is kept from his loom. and stoppeth the spinner’s cunning. nor was La Calunnia painted. between the young bride and her bridegroom. Quantum mechanics, the most powerful theory of the material world that humans have ever possessed, comes with a heavy price--the renunciation of knowing what is really going on in the world. Use this theory, give up reality. And perhaps the most peculiar fact about the quantum reality mystery is that it's hidden in plain sight. The quantum math is clear, complete and unambiguous; we can calculate with perfect precision exactly what will happen in any experiment that we can imagine. So even though we cannot visualize what's happening "behind the scenes" of the phenomena that we observe, we can use the theory itself to constrain any model that we might wish to construct about the "reality that exists beneath the quantum facts." The results of such indirect reasoning about deep reality have been posted. The conclusion: quantum reality is "magic". Physics is all about making measurements. But quantum theory says that for every measurement you might like to make (say position) there is a COMPLEMENTARY measurement (in this case momentum) whose accuracy is disturbed by the first measurement. The existence of complementary pairs of observables is an entirely quantum feature not present in classical physics. But for most quantum systems, one can often pick out a set of "compatible observables", that can be measured without mutual interference. Such measurements form a kind of "classical sector" in the full quantum realm, and one might suppose that the reality underlying this classical sector could be explained using classical concepts. The Kocken-Specker theorem, published in 1967, proves this supposition to be false. Even the classical sector of quantum physics cannot be explained by an underlying classical reality. It can only be explained by "magic". Simon Kocken tried to evoke the flavor of this "quantum magic" in his "Parable of the Over-protective Seer". In ancient Nineveh there lived an ingenious wizard-astrologer whose beautiful daughter was besieged by many suitors. To prevent his daughter from marrying an unworthy man, the wizard devised a "suitable suitor" test. On a table in the royal interview room, the wizard placed three jewel boxes. The suitor's task was to state "FULL" or "EMPTY" and then select the two boxes that confirmed his prediction. If, for instance, the suitor said "FULL" and both his chosen boxes contained jewels, then he could claim his princess bride. Dozens of men attempted the test--with precisely the same result. Whatever pair of boxes a suitor would choose, one always contained jewels, the other turned up empty. Since there is no way that anyone can fairly prepare three boxes, without two of them being either full or empty, pure logic suggests that the seer used "magic"--some sort of trickery--as part of the "reality" behind his test. 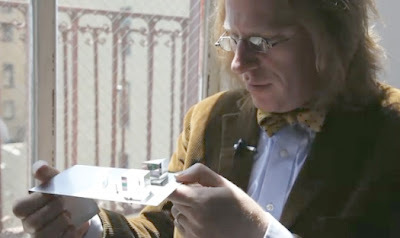 Quantum theory is strange but not strange enough to build such boxes. However Simon Kochen (an American mathematician) and Ernst Specker (a Swiss mathematician)--using the same sort of reasoning that proves the fictional seer must use magic--proved that the quantum world must use a similar "magic", even in its "tame" classical sector, to produce its quantum facts. K&S's original proof was exceedingly complicated. It involved a diagram with 117 "rays". Their proof was simplified by Asher Peres to 36 rays, then to 18 rays by Adan Cabello, then to 8 rays by Rob Clifton. Recently Vladivostok-born Alexander Klyachko entered the frey. Klyachko (a visiting math professor at Bilkent University in Ankara, Turkey) devised a proof of the K-S theorem using only 5 rays. Moreover he expressed his proof in the form of a testable inequality (the KCBS inequality). If a physics experiment obeys the KCBS inequality, then you don't need "magic" to explain it. However if a physics experiment violates the KCBS inequality, then (by reasoning of the kind that exposed the seer's trickery) the reality behind that experiment must be "magic". 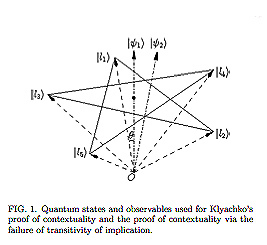 Klyachko's 5-ray proof works for the smallest quantum system (a spin-1 particle) that satisfies the K-S postulates, so his demonstration will no doubt enter the record books as the most concise proof of the existence of "quantum magic". Nature is full of spin-1 particles, but to do complex experiments on such particles is devilishly difficult. Recognizing the practical difficulties of testing his KCBS inequality on actual spin-1 systems, Klyachko cleverly devised an equivalent physical system composed of two photons in the same spatial mode (the so-called "biphoton") that possess exactly the same external quantum properties as an actual spin-1 system. Inspired by Klyachko's work, Radek Lapkiewicz and colleagues in Anton Zeilinger's lab at the University of Vienna recently prepared a similar optical analog to the spin-1 particle using the considerable resources of modern quantum optics. The LLSLRWZ collaboration tested the KCBS inequality and demonstrated that the inequality was violated. Hence reality has to be contextual. Reality cannot be modeled by ordinary classical concepts. Reality, in short, must be "magic". In light of this blog's tantric theme and the parable of the magic jewel boxes, one is tempted to suppose that, like Simon Kochen's over-protective seer from Nineveh, Mother Nature might be using "quantum magic" to prevent adolescent apes with plutonium from tinkering with reality's deep primordial innocence. Some secrets may be only suitable for grownups.